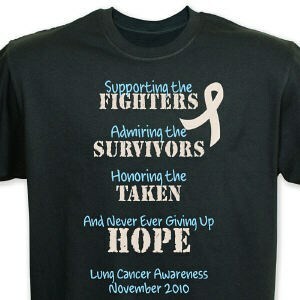 Our Lung Cancer Awareness T-shirt is a great way to support the fight against Lung Cancer. Have fun with this unique Lung Cancer Awareness Tee Shirt while educating everyone around you about the need to be aware. It is a very nice shirt, exactly as I wanted , actually the size of the print was even bigger than I thought which was a good thing! Nice material not a thin cheap material. Great product!!!!! We offer many Personalized Cancer Awareness shirts. These Personalized Shirts, which help the fight against Cancer make great gifts. Also great for Charity events or Breast Cancer Awareness walks.